Using HDMI cables, connect up to eight Hi-Def sources to the HDMI inputs on the matrix. 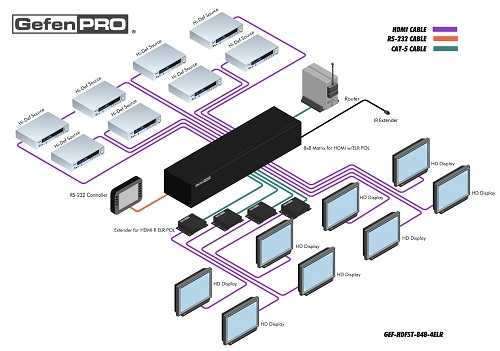 Connect up to four HDTV displays to the HDMI outputs on the matrix and up to four HDTV displays to the supplied ELR-POL receivers. Use a single CAT-5e cable to connect each of the receivers to the matrix. An external power supply is not required because power is delivered by the matrix over the CAT-5e cables. 3D content can be displayed when connecting a 3DTV and 3D source.Connect the included AC power cord to the matrix and plug it into an available electrical outlet. Turn on the matrix by pressing the power switch. Apply power to sources and to the displays. 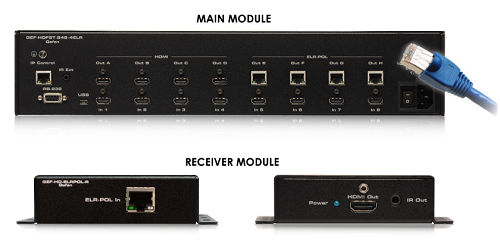 The Hi-Def sources can now be routed to any display by using the IR remote control, RS-232 port, IP (Telnet or Web GUI), or by using the front-panel push buttons.